As part of our celebration of the 25th Anniversary of the French Frigate Shoals sea turtle tagging programme, we sent email to George Balazs of the National Marine Fisheries Service (NMFS) and gave him the tag numbers of four Honokowai females. We then requested that he advise us should any of these turtles crawl up to nest this season. On the evening of June 29th, we received a message on our answering machine. Mendelbrot (U 359), a turtle we have known since 1993, was sighted on East Island laying her eggs. Later in email, George reassured us the turtle taggers at the French Frigate Shoals were taking very good care of Mendelbrot. "Have faith. She will return to you." The white newly painted D 62 on the right rear portion of her carapace fairly shouted at us. On our morning dive of August 16th, we sighted Mendelbrot for the first time this summer. We recognized her by her facial markings. The white newly painted D 62 on the right rear portion of her carapace fairly shouted at us. We notified George by email, letting him know the date, time, and location of Mendelbrot's first sighting, but we had to wait until he could confirm that D 62 really matched the tag numbers U 359. U355 RHF (right hind flipper) and U359 LFL (left front flipper proximal tag site). CCL= 105.5 cm, SCL= 98.0 cm. First seen in 1998 nesting on East 6/5/98. In our Week One summary, we reported our first sighting of Tiamat. We have known Tiamat since 1991 and had seen her each summer except last year. We really weren't surprised--she'd grown large enough to make her "run" at the French Frigate Shoals (FFS). It caused us no special worry. After all, Tiamat's condition had improved immensely and she was clearly winning her battle with FP. We were confident we'd see her again for 1998 and likely she'd be wearing her first set of tags. We resighted her almost immediately this summer, resting in her favourite place. She remembered us and that made it easy to read her tags. She carries 122C and 123C on her hind flippers. The good hearts at FFS had engraved "V 40" on the right rear portion of her carapace as well. The good hearts at FFS had engraved "V 40" on the right rear portion of her carapace as well. V40. Recorded nesting on East 5/30/97 and 6/15/97. SCL= 90.0 cm. Tags= 122C left hind, 123C right hind, 124C left front, 125C right front. Biopsy (nip from trailing of hind flipper) taken for DNA analysis. We informed George just how special both Mendelbrot (U 359 D 62) and Tiamat (122C V 40) really are. Both these honu were subadults when we first met them. During our observation time, they both nested at FFS and received their first set of tags. Both had fibropapilloma disease and both improved! Mendelbrot and Tiamat are Honokowai FP regression cases. Best of all, both might just have some very special genes that lets them battle and win the fight against FP. Their hatchlings scrambling across East Island sand just might carry the same "good fortune" into the next honu generation. At least this is our hope! 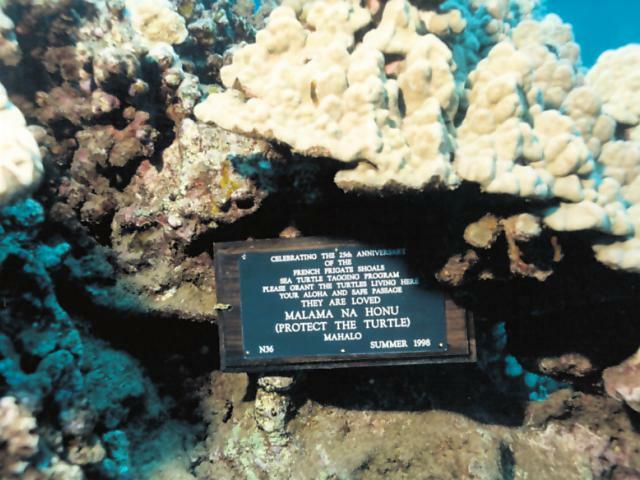 Last week we reported that we laid down two plaques at our dive site. The first bears the initials GHB in honour of George H. Balazs, the pioneer researcher of the Hawaiian green sea turtle. The second plaque is marked with N36, and pays homage to the World War II vintage airplane that first flew George to the French Frigate Shoals on June 1st, 1973. An FAA DC3, it bore the registration N36 and is remembered fondly by those who flew in her. 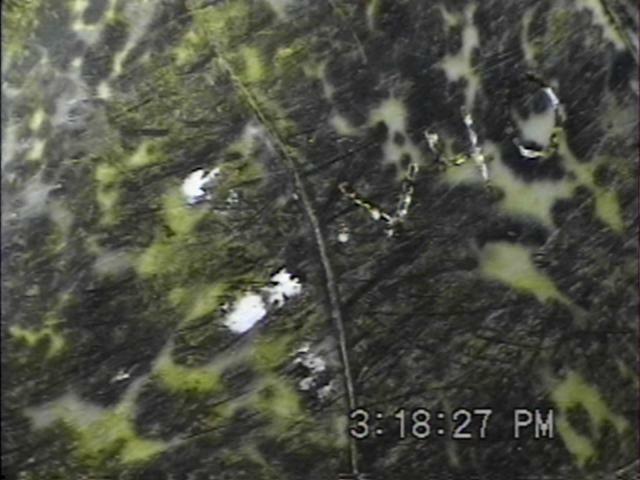 In our continuing celebration of the 25th Anniversary of the French Frigate Shoals sea turtle tagging programme, we share this photo of the "N36" plaque laid down at a place we call "East House" at our dive site. 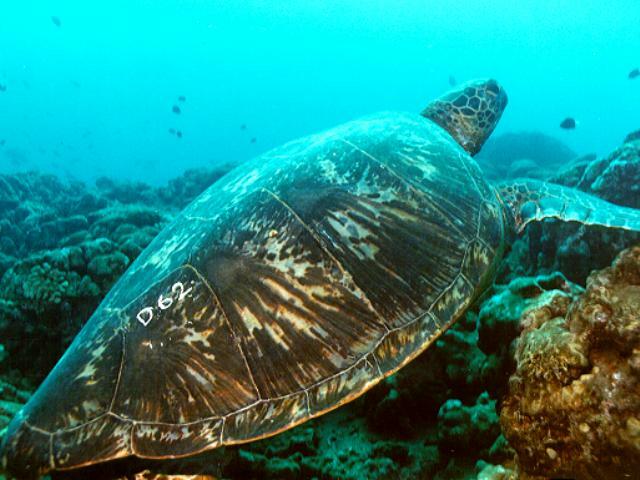 It's a favourite place where the honu can scratch their backs and hang out together. At time of writing, Osha has made 13 dives with us. There would have been more but the swells here have been rocking and tossing us through the rinse cycle. We only have a small opening in the seawall with which to "thread the needle" and get back onto shore. Our last dive was a tad too exciting for these two Canadians and someone from Iowa who did his checkout dive in a quarry with nothing you could refer to as "visibility." Osha is a true hardeebar and took everything in stride. It has been wonderful diving with Osha. We've never seen anyone so quickly accepted by the turtles as he has been. As expected, he is an excellent and sensitive observer. He reads and respects the turtles' signals and this is probably the reason he earned their trust. Standout memories include Osha posing with Nui for a farewell photo. Nui lifted and went for air and Osha followed the large turtle part of the way to the surface. (This Osha did slowly and carefully never rising faster than his bubbles.) Human and turtle swimming close together was really quite something to watch. Human and turtle were watching each other. Nui also provided another wonderful memory. 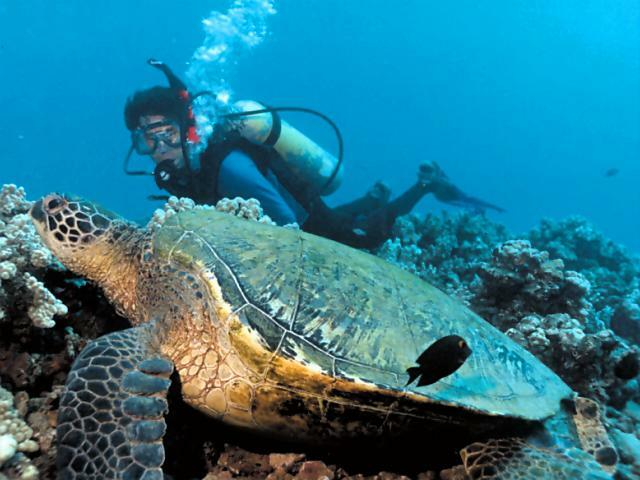 He was resting at his favourite location and Osha approached and rested right beside the big honu. Nui looked at Osha, showing only the slightest bit of interest. Human and turtle were watching each other. Then something wonderful happened. Nui paid Osha the greatest compliment a Hawaiian green sea turtle can pay a human being. With Osha laying right beside him, Nui closed his eyes and went to sleep! Complete and utter trust. Weather forecasts projected a new set of swells would roll through by weekend. We decided to make a farewell dive just in case we wouldn't make it in the water again. We would present orchid and carnation leis to the honu. We told Osha we do this at the end of each summer to honour the honu and to thank the ocean for safe passage. As with all our dives, we met Osha at the beach, and on this dive he showed up with his own lei--one he acquired the day before during his trek in an upcountry rainforest. The lei was woven from a special fragrant Hawaiian plant, unapologetic green with small lancelot leaves. Beautiful and subtle--a gift from the land by this Iowan Friend of the Honu. Osha presented his lei to Ho'oulu (formerly known as Gotcha) by tying it to a coral head right beside this skip-no-lunches laid-back honu. Later, Osha commented that Ursula was right about how the honu would charm him. He added, though, that he simply had not had any idea of the extent they would carve their way into his heart. ...he simply had not had any idea of the extent they would carve their way into his heart. He spoke with affection and appreciation for the Honokowai honu, and revealed just how grateful he was of the time he had with them. That is precisely how we feel about their company. 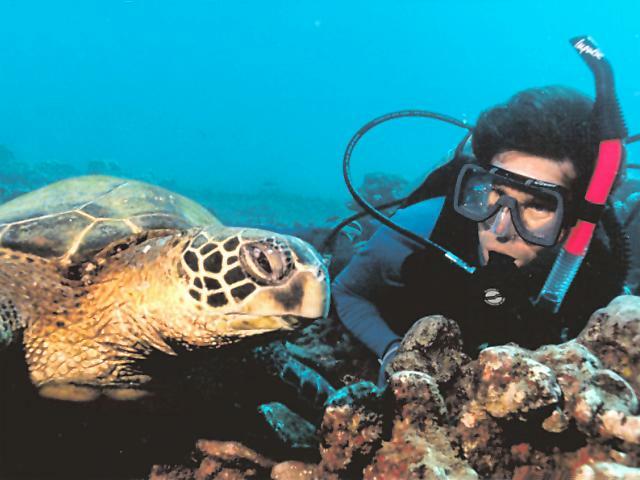 It's a privilege to dive with Hawaiian green sea turtles. After two weeks here, we believe Osha would agree a hundred percent with that statement.